Remarkable story about Cian Morris and his £60 new hand! While we have had many good news stories recently, very often it’s the bad news which makes the front pages of our regional press. However, in today’s South Wales Echo all bad news is banished to the inside pages! 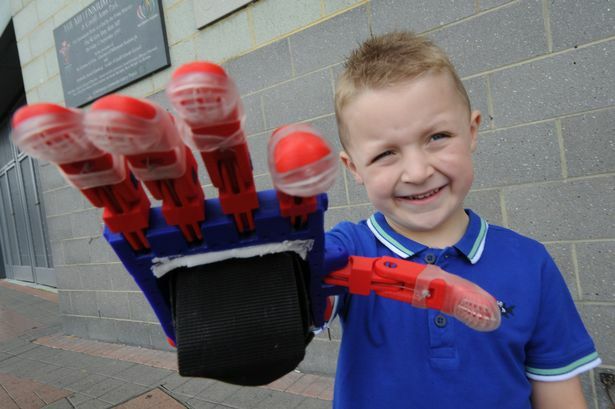 The reason for this is the truly remarkable story of five year old Cian Morris who was born without fully formed fingers on his right hand but has now had a prosthetic hand made using revolutionary 3D printing technology and that cost just £60 to make. Developed by researchers from the FabLab team at Cardiff Metropolitan University, this innovative device which is operated by Cian using just his wrist could be the salvation for many children and presumably adults suffering from similar problems. Once again, this is proof that we have some of the very best researchers and scientists working and living in our capital city. Let’s celebrate this wonderful news for Cian and his family with the rest of the world. Cardiff really is in the news recently for some very positive reasons. Well done FabLab manager Martijn Gommeren and your team, we are proud of you all.